The Herzl Museum is an interactive, audiovisual experience that takes its visitors through the life of Theodore Herzl, the visionary of the state of Israel. Visitors will get to learn about Herzl's journey in a way that is both educational and fun. The tour must be booked in advanced, can be in seven different languages and is suitable for families (6+). The Herzl museum is an interactive, audiovisual experience that will take its visitors through the life of Theodore Herzl, visionary of the state of Israel. 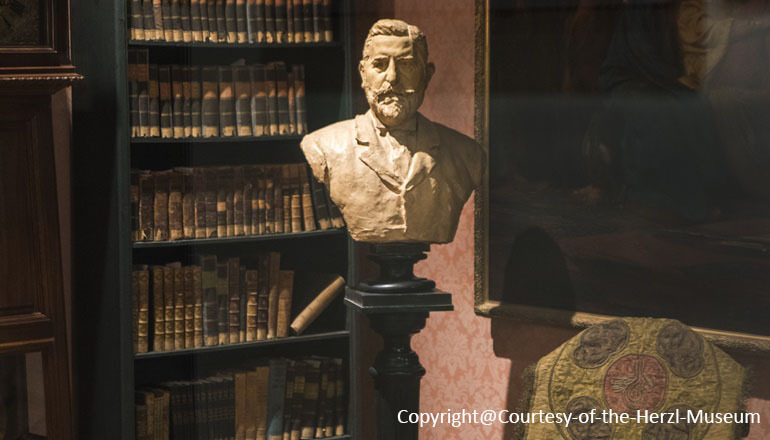 Entering into the streets of late 19th century Paris, you will move through the various exhibits and engage with Herzl's turbulent journey of transforming Zionism from an idea into a movement. Understanding the sacrifices that a single man had to make to lay the foundations for the modern state of Israel will inspire people of all ages. You will walk away with a deeper understanding of who, the man behind the mountain, truly is and how he embodies the idea, "If you will it, it is no dream". The tour must be booked in advance and can be in seven languages, including Hebrew, English, Russian, German, French, Spanish and Amharic. This activity is suitable for families (6+) and is handicap accessible. Museum tours must be arranged in advance, including bookings for individual visitors. Visitors arriving without a booking will be able to enter based on places available on a tour in the appropriate language. Museum tours can be booked separately in the following languages: Hebrew, English, Russian, German, French, Spanish and Amharic. The museum is located at the entrance of Mt. Herzl, Herzl Blvd., Jerusalem.